Southwest Medical Center is proud to announce the arrival of internal medicine physician, Dr. Akshath Kamath to Liberal. Dr. Kamath was born and raised in a small town called Shimoga in India. It was in his hometown that he first discovered his passion for the medical field. Dr. Kamath went on to complete his Bachelor of Medicine and Bachelor of Surgery at Fr. 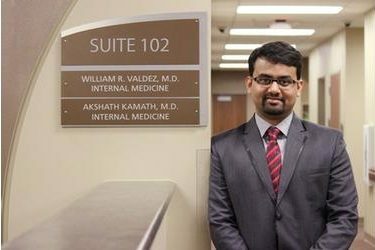 Muller Medical College, a Catholic charitable hospital in Mangalore, India before finishing his residency at the University Medical Center Hospital in Lafayette, La. in June. During his residency in Internal Medicine, Dr. Kamath also served as a research assistant studying cardiovascular risk factors in the indigenous population. Throughout his medical training, Dr. Kamath has kept his focus on serving small communities. Dr. Kamath, who recently married his wife, Soumya, says he believes they will “fit right into” the Liberal community. “I’ve always been a small-town kind of person because I was raised in one. I like the small-town charm and have realized that people in small towns are gracious, friendly and courteous. So far it’s been great. We’ve been going around Liberal looking at neighborhoods. My wife likes it, so I guess that’s what matters,” he said with a laugh. In his spare time, Dr. Kamath says he enjoys reading novels and watching LSU and New Orleans Saints football games. Dr. Kamath will be located in the Southwest Professional Physicians Internal Medicine clinic at 305 W. 15th St., Suite 102 inside the Medical Office Building at Southwest Medical Center with Dr. William Valdez. Dr. Kamath began seeing patients today and accepts all insurances, including Medicare, Medicaid and Blue Cross/Blue Shield. To make an appointment with Dr. Kamath, call (620) 624-0702.